Ferdinand Hodler (1853–1918), The Reader (c 1885), oil on canvas, 31 × 38 cm, Museo Thyssen-Bornemisza, Madrid, Spain. Wikimedia Commons. Next month, I will be commemorating here the centenary of the death of the great Swiss artist Ferdinand Hodler (1853–1918). He is not a painter that I have known well, and I can’t recall seeing any of his paintings in the flesh. Researching his life and work has been revelatory, though, and in the coming weeks I’d like to share with you what I have found out. I hope that you too will come to appreciate the work of one of the period’s most versatile and innovative painters. Hodler was born the first child of a poor, working family in Bern, Switzerland. 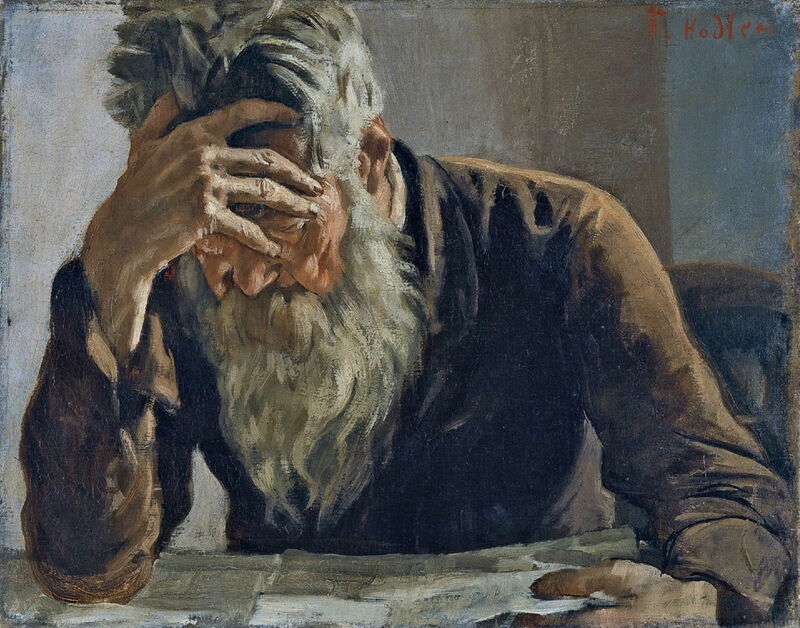 His father, a carpenter, died when Hodler was seven, but the following year his mother married a second time, to a decorative painter who painted stage scenery, etc. Tuberculosis was rife in the poor quarter of the city where they lived, and Hodler saw his brothers and sisters die one after the other, then his mother died of TB too when he was only fourteen. By that time, Hodler had been helping his stepfather in his work, and clearly showed artistic promise. In about 1868, at the age of fifteen, Hodler was apprenticed to a local (fine art) painter, Ferdinand Sommer, who painted souvenir landscapes for tourists in the manner of Alexandre Calame (1810-1864). That apprenticeship was cut short because of an accident, following which Hodler went to live with an uncle in Langenthal. There, he set up his first studio, and started to sign and sell his paintings. That year, Hodler walked to Geneva, where he set up studio and tried to make his living from his art. 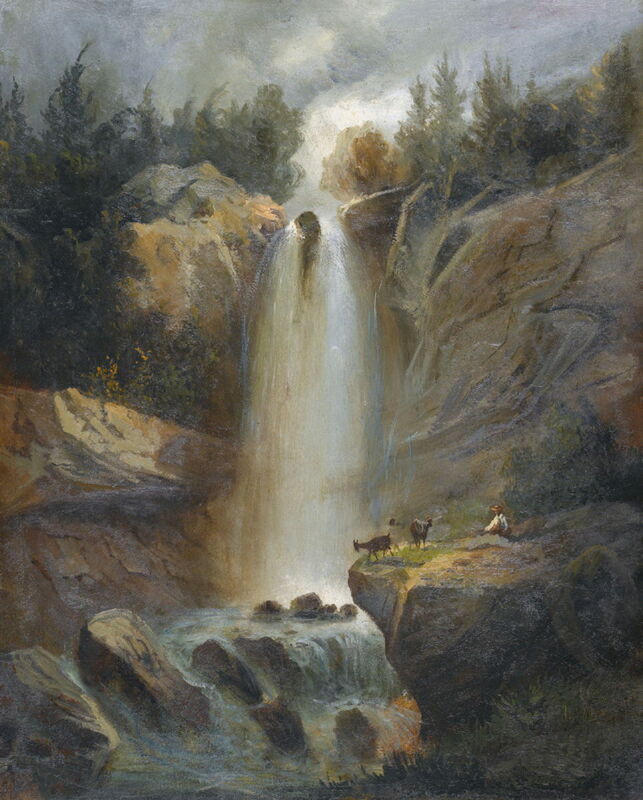 Ferdinand Hodler (1853–1918), The Upper Reichenbach Falls (c 1871), oil on cardboard, 65.5 × 53.5 cm, location not known. Wikimedia Commons. 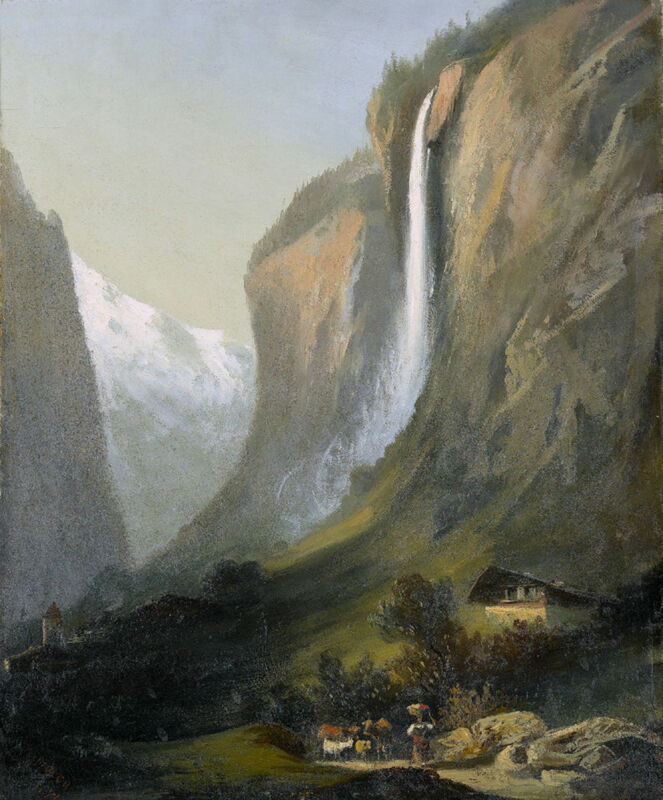 Among his earliest surviving works are impressive views of two of the most famous Alpine waterfalls: The Upper Reichenbach Falls (c 1871), above, and The Staubbach Falls (1871), below. Both are painted in oils on cardboard, and the sort of landscape which must have been very popular with tourists. Ferdinand Hodler (1853–1918), The Staubbach Falls (1871), oil on cardboard, 65 × 53 cm, location not known. Wikimedia Commons. Ferdinand Hodler (1853–1918), Castle Schadau with Scherzlingen Church and Blümlisalp (1871), oil on cardboard, 35 × 47.5 cm, location not known. Wikimedia Commons. Castle Schadau with Scherzlingen Church and Blümlisalp is another tourist landscape he painted in 1871. In 1872, Hodler was granted permission to remain in Geneva, and to copy paintings by Calame and François Diday at the Musée Rath. His talent was spotted by Barthélemy Menn, former student of Ingres and professor of painting and director of the École des Beaux-Arts in Geneva, and Hodler was offered a place there at no cost. In 1874, he won the Concours Calame with one of his landscapes. In 1877, Hodler visited Paris, then later that year travelled to Madrid, where he stayed for several months, painting, and studying the works of the great masters in the Prado. Ferdinand Hodler (1853–1918), Sheep at the Sentier des Saules (1878), oil on canvas, 97 × 135 cm, location not known. Wikimedia Commons. While he was still in Geneva, Hodler painted this rustic view of Sheep at the Sentier des Saules (1878), on the bank of the River Rhône just before it merges with the River Arve at La Jonction. This remains one of the parks in the city. Ferdinand Hodler (1853–1918), Landscape Near Madrid (1878), oil on canvas, 71 × 50 cm, Private collection. Wikimedia Commons. 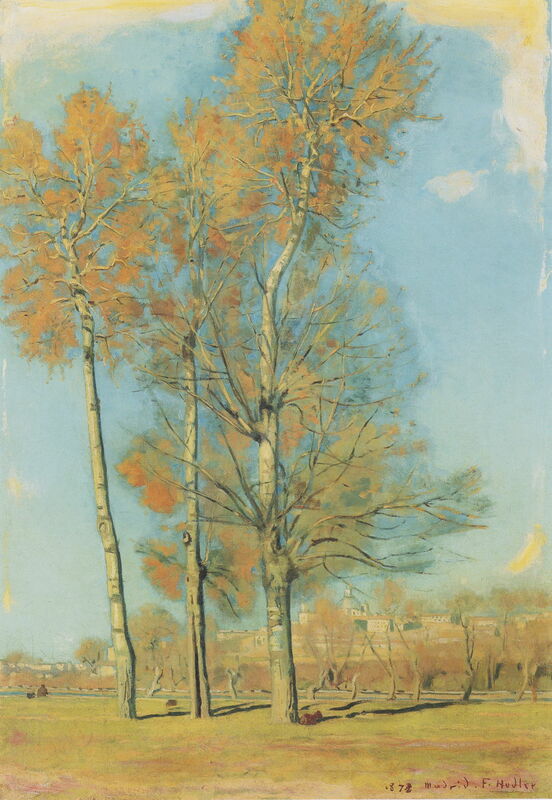 In Madrid, Hodler’s landscapes became brighter, higher in chroma, and increasingly artistic rather than just representational, as shown in this Landscape Near Madrid (1878). Ferdinand Hodler (1853–1918), Watchmakers’ Workshop in Madrid (1879), oil on canvas, 81 × 94 cm, Kunstmuseum Luzern, Lucerne, Switzerland. Wikimedia Commons. 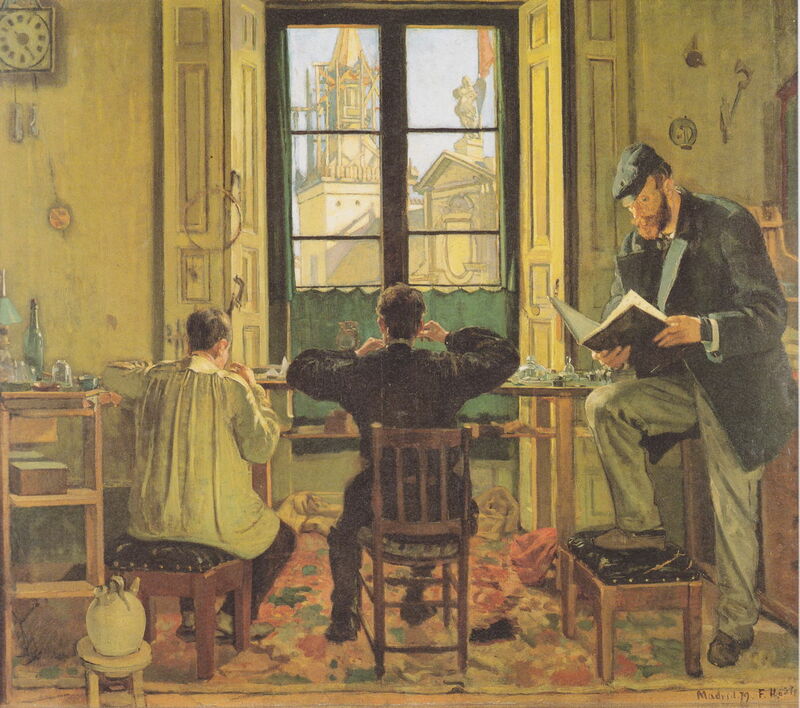 Apparently after his return from Madrid, Hodler painted this view of a Watchmakers’ Workshop in Madrid (1879), one of his first figurative works. At this time, Hodler continued his studies working as an assistant to Edouard Castres, a successful painter of panoramas. Ferdinand Hodler (1853–1918), Self-portrait with Wing Collar (1879), oil on canvas, 72 × 102 cm, Museum Oskar Reinhart am Stadtgraben, Winterthur, Switzerland. Wikimedia Commons. 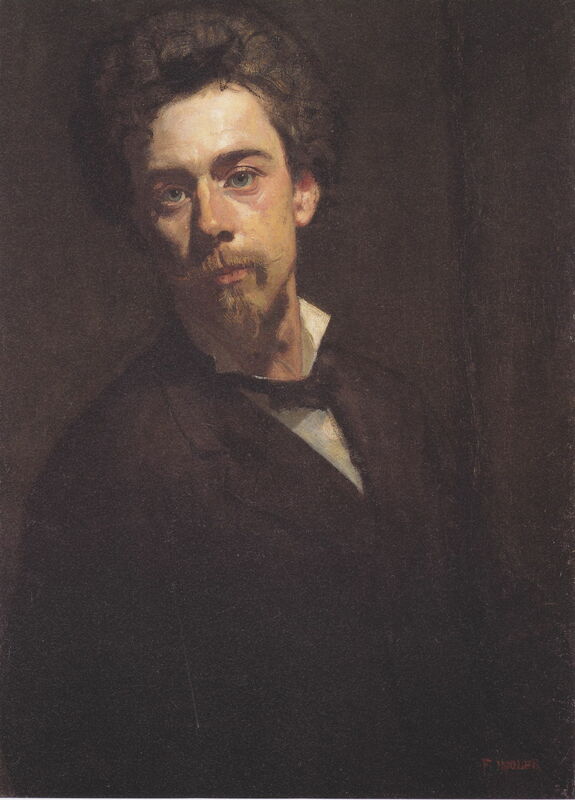 Hodler’s early Self-portrait with Wing Collar from 1879 shows his very traditional style. Ferdinand Hodler (1853–1918), The Little Fisherman (c 1879), oil on canvas, 22 × 16 cm, location not known. Wikimedia Commons. 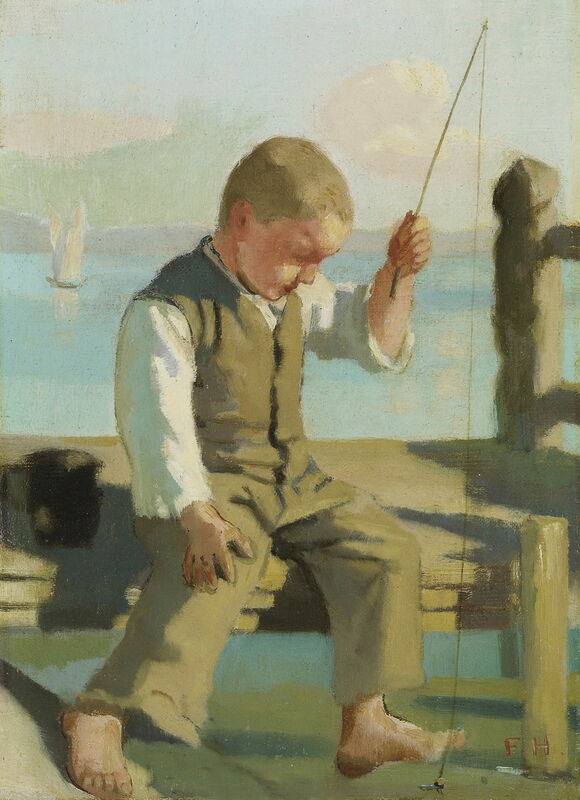 The Little Fisherman (c 1879) is a tiny oil sketch of a young boy apparently fishing on Lake Geneva. Ferdinand Hodler (1853–1918), Near La Jonction (c 1880), oil on canvas, 25.5 × 36.5 cm, Museum zu Allerheiligen, Schaffhausen, Switzerland. Wikimedia Commons. 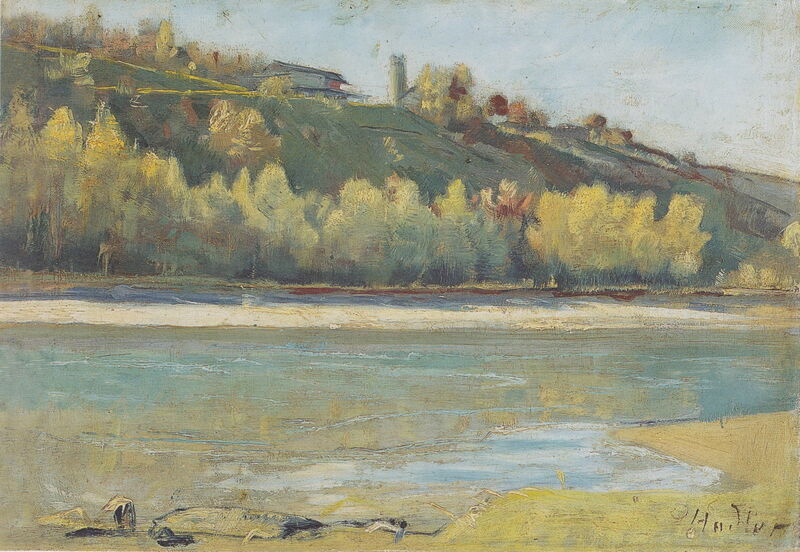 Towards 1880, Hodler devoted much of his time to painting landscapes en plein air. 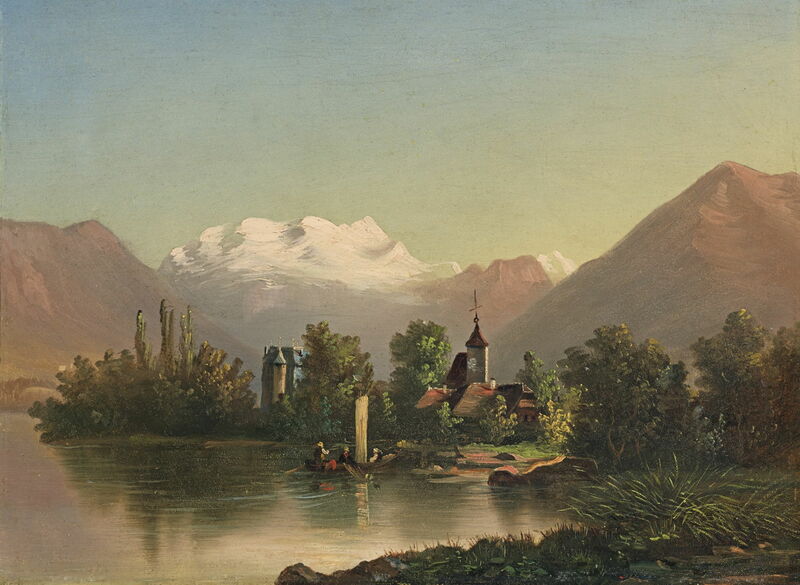 At La Jonction (c 1880) is a small canvas showing the junction between the Rivers Rhône and Arve in Geneva. In 1881, Hodler had his first paintings exhibited overseas, two being shown in London at an exhibition of Swiss art. Ferdinand Hodler (1853–1918), Devotion (1882), oil on canvas, 80 × 100 cm, Private collection. Wikimedia Commons. 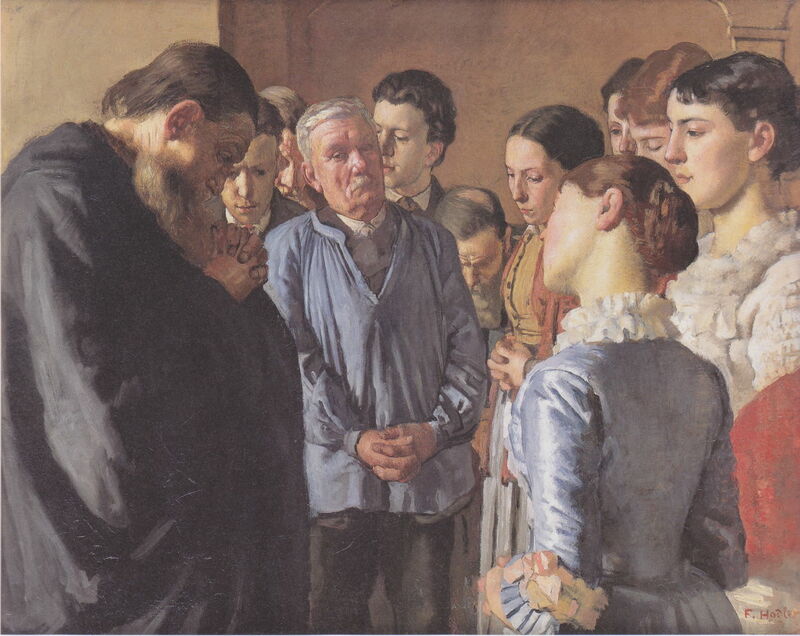 In the early 1880s, Hodler started painting figures in earnest, including Devotion (1882). The artist provides us with scant clues as to its reading. It appears to be set inside a church or similar communal area. The large man at the left, who is probably a priest, is leading ten family members together in prayer. One figure, an older man dressed in a simple blue smock, looks at the priest out of the corner of his eyes. He has a wry smile on his face, as if disbelieving what the priest is praying for. In the summer of 1883, Hodler travelled to Munich, where he studied the work of Dürer in the Pinakothek, in particular The Four Apostles which was to influence him. Hodler was showing increasing interest in Symbolism, and had been developing his personal art theory since he had been a student. His work was about to change from realism. 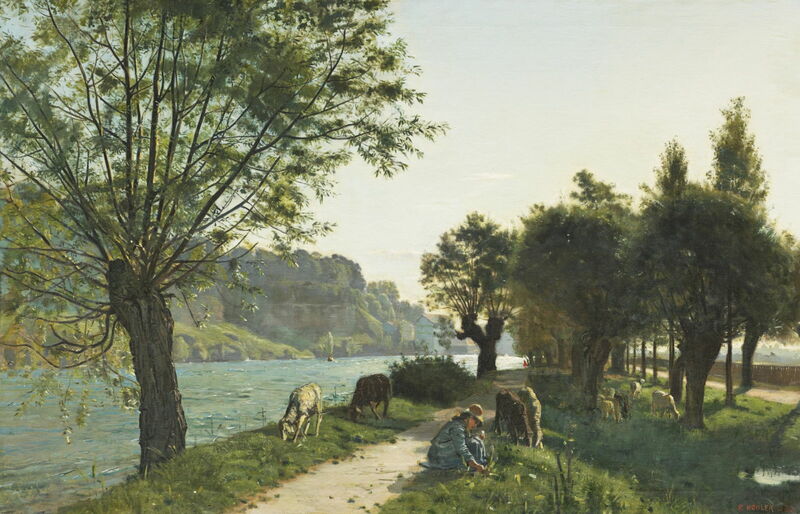 Posted in General, Life, Painting and tagged Calame, Hodler, Ingres, landscape, painting, realism. Bookmark the permalink.